This Award winning artist has developed a solid global fan-base that connects deeply with the messages in his music, touring extensively over the past 5 years to the largest of Reggae stages around the world.Aided by his excellent “Bebble Rockers” band; he has brought his message and power to tens of thousands of people in North America,Europe, Central America and the Caribbean. Hitting stages such as“Reggae on the River” (US), Rebel Salute (JA), Sierra Nevada WorldMusic Festival (US), “Rototom Sunsplash” (Spain), Musa (Portugal), SummerJam (Germany), Reggae Sumfest (JA), Reggae Sundance (NE),Reggae Sun Ska Festival (FRA), South by South West (US), BoomTown(UK) as well as headlining multiple 20+ multi-city club tours; Kabaka is well known for delivering an electrifying and entertaining live performance. 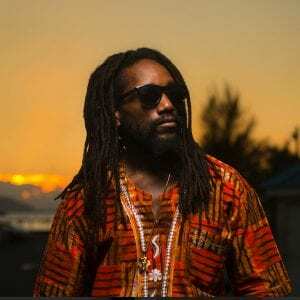 He has just recently concluded the 30 show, UnitedStates “Stony Hill” tour with Damian Jr. Gong Marley to rave reviews. Following the global success of his impactful hit single “Well Done” in2015; Kabaka released his “Accurate” mixtape presented by music superpower Major Lazer and Walshy Fire to tremendous reception with the mixtape proving to be an instant classic amongst reggae/hiphopfans. In 2017 he topped the Global Reggae Charts with the anthem“Can’t Breathe” the first single off his soon to be released debut full length album “Contraband”. The project is being executive produced by Damian “Jr Gong” Marley and is a joint release with Bebble RockMusic and Ghetto Youths International. In fact the Pyramid has released a powerful catalogue over the years including the critically acclaimed “Rebel Music EP” and the Billboard top 10 charting “Lead the Way EP”; singles such as “Never Gonna Be A Slave”, “No Capitalist”, “Mi Alright” with Chronixx, and “Free FromChains” as well as music videos for the popular “Warrior” featuring Protoje, “World Wide Love, “Liberal Opposer” and “High and Windy”with Sara Lugo; he has achieved regular rotation on local and international airwaves. Kabaka Pyramid is touted by many as a leader in the new wave of powerful reggae artists coming out of Jamaica. Kabaka has achieved recognition both locally and overseas, placing #1on the BILLBOARD Next Big Sound Charts and also featured by the popular music conglomerates, TheFader, MTV Iggy, Okayplayer, Reggaeville amongst many others in the media landscape. In 2013 he was awarded breakthrough artist of the year by the Jamaica ReggaeIndustry Association. He is also a three (3) time nominee for Song of the year 2013, 2014 and 2015 for the tracks “No Capitalist”, “MiAlright” and “Well Done” respectively. The lyricist has in addition won the award for best reggae recording by Canada’s highly respected JunoAwards with Exco Levi. With a mission to steer future generations towards harmony and unityKabaka Pyramid is primed and focused on bringing a righteous and conscious way of thinking to the masses through Reggae Music. “Possessing a solid list of skills not only in the booth but on the mixing board, and an array of lyrics that preach a message of love, self-awareness and African pride, Kabaka Pyramid is well on his way to a career that should not only lead to greatness but also lead a lot of fans to righteousness” Aesthetics Now Mag. © 2019 Welcome to Jamrock Reggae Cruise. All rights reserved.